I’m trying to use my slow cooker more. There’s nothing better than coming home from work to dinner — already prepared! — and the house smelling delicious. I love chili — the spicier the better — but a couple of things clinched this one for me. 1) There wasn’t a lot of prep needed. I’m always surprised by the amount of “pre-cooking” that slow cooker recipes call for. Isn’t the point of the slow cooker that you don’t have to do much? Just throw it in and voila…meal prepared? Sigh. 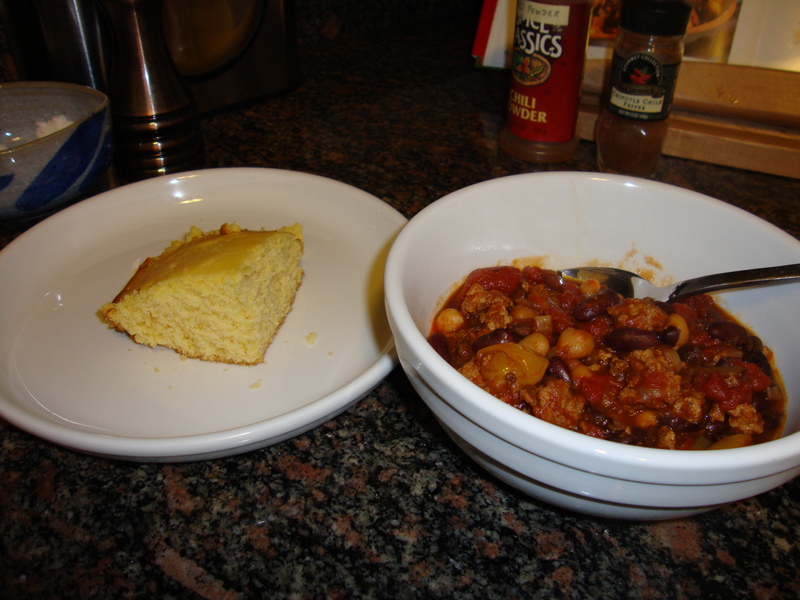 2) I’d never had a chili with chickpeas and I was curious. Yes, I realize this isn’t “real Texas chili.” But I give equal attention to both bean-inclusive and bean-free chili. I don’t discriminate. 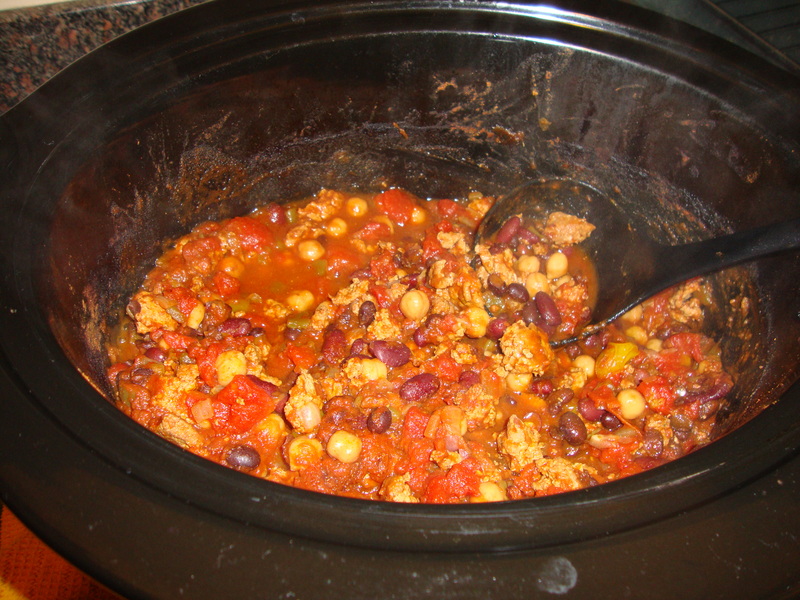 This is a VERY basic chili, and the version that resulted from this recipe was not the best one I’ve ever had. BUT. (But!) It was solid, super easy and the turkey was surprisingly tender. With a few little tweaks this could be a winner. My main problem was that it wasn’t spicy enough. I had to doctor up the end product with a good amount of Cholula (my fave) to give it enough zip. But this is an easy fix. First, add more chili powder. Two tablespoons wasn’t nearly enough. I’d also call for some other spices too, to add some more flavor depth. Go with cumin, cayenne pepper, even a little bit of chipotle chili powder. In fact, season up the meat a little bit with salt and pepper and chili powder before you cook it. All of this will make the chili more flavorful and give it more heat. And chili should be spicy. Period. I added in a pint of yellow grape tomatoes I had on hand to add some fresh tomato flavor. The more fresh veggies you add, the better. Add a chopped fresh jalapeno (or even a jarred one, with some of the juices) for some extra heat. Try adding some cheese on top to garnish, with chopped onion and cilantro. Even some crushed up tortilla chips to give it some crunch and texture. If you don’t want to cook turkey in the morning (and who does? ), cook it the night before and refrigerate. Then throw everything in the slow cooker in the morning. I served this with cornbread, a guaranteed winner. Best brand (if we’re talking not from scratch): Marie Callendar’s. It’s super moist and the perfect chili accompaniment. Cook and stir turkey and onion in medium nonstick skillet over medium-high heat until turkey is no longer pink. Drain and discard fat. Transfer to 4 1/2-quart slow cooker. 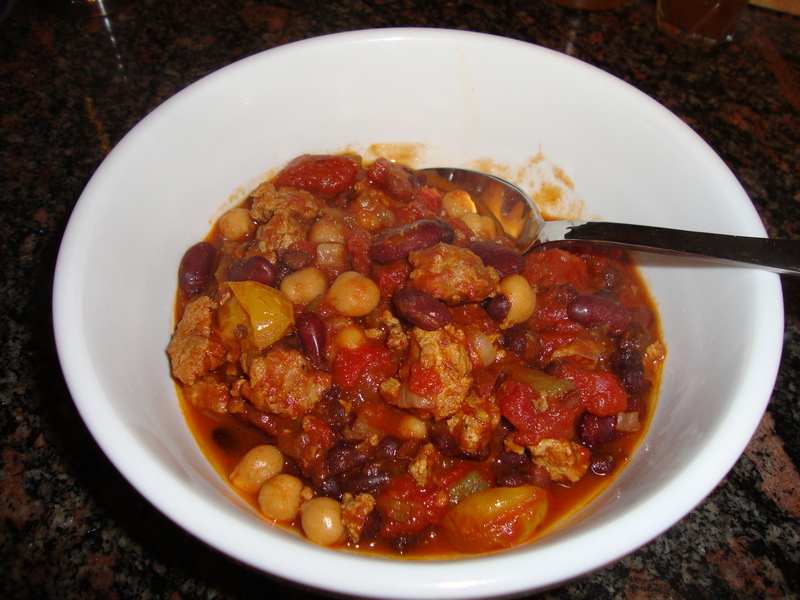 This entry was posted in Recipes, Uncategorized and tagged chili, ground turkey, spicy by Tricia. Bookmark the permalink.